A solar cell or photovoltaic cell is a device that converts solar energy into electricity by the photovoltaic effect. Assemblies of cells are used to make solar modules, which may in turn be linked in photovoltaic arrays. Solar cells are expected to be capable of producing electricity for at least twenty years without a significant decrease in efficiency. 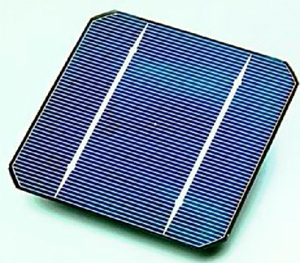 Solar cells are manufactured primarily in Japan, China, Germany, Taiwan and the USA, although many other nations have gained significant solar cell production capacity. Photovoltaic Systems are relatively simple in design, have no moving parts, and need little maintenance. Once the parts are purchased and installed, solar power costs nothing. When solar manufacturers and installers talk about costs, they usually speak in terms of dollars per installed watt. PV systems may be designed to provide any amount of power depending on the specific needs of the homeowner and depending on how much the homeowner is willing to invest at that time. Think about PV power as an investment in energy security and environmental responsibility, as opposed to being purely financially beneficial. By owning a PV array and generating clean electricity, one becomes part of the energy movement and gains some independence from the price fluctuations and negative impacts of fossil fuels. A major benefit of solar power is the ability to easily expand a system's size and increase the amount of energy being produced. A solar panel will generate a minimum of four times the amount of energy used in its production. Because the fossil fuel industry receives an estimated $15 billion each year in federal government subsidies, the solar industry currently has a tough time competing. However, fossil fuels may be depleted within 40 years, and the solar energy industry is currently growing at a rate of 25% per year. With the rising cost of energy, solar energy is steadily gaining popularity, especially since more and more states and electrical companies pay for more power than gets fed into the grid. The homeowner may be able to be paid for this excess power by the power company or other incentive program. Likewise, during times when the array is not producing enough power for the home, the homeowner can buy the difference needed from the grid. The process is seamless and automatic. 1. Photons in sunlight hit the solar panel and are absorbed by semi-conducting materials, such as silicon. 2. Electrons (negatively charged) are knocked loose from their atoms, allowing them to flow through the material to produce electricity. The complementary positive charges that are also created (like bubbles) are called holes and flow in the direction opposite of the electrons in a silicon solar panel. 3. An array of solar panels converts solar energy into a usable amount of direct current (DC) electricity. 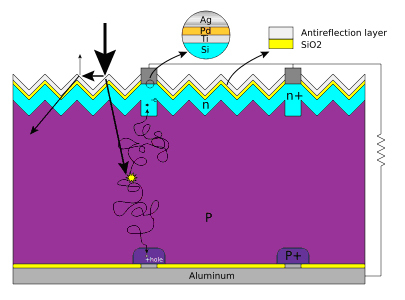 Basic structure of a silicon based solar cell and its working mechanism. By far, the most prevalent bulk material for solar cells is crystalline silicon (c-Si), also known as "solar grade silicon." Bulk silicon is separated into multiple categories according to crystallinity and crystal size in the resulting ingot, ribbon, or wafer. 1. Monocrystalline silicon (c-Si): often made using the Czochralski process. Single-crystal wafer cells tend to be expensive, and because they are cut from cylindrical ingots, do not completely cover a square solar cell module without a substantial waste of refined silicon. Hence, most c-Si panels have uncovered gaps at the four corners of the cells. 2. Poly- or multicrystalline silicon (poly-Si or mc-Si): made from cast square ingots - large blocks of molten silicon carefully cooled and solidified. These cells are less expensive to produce than single crystal cells but are less efficient. 3. Ribbon silicon: formed by drawing flat thin films from molten silicon and having a multicrystalline structure. These cells have lower efficiencies than poly-Si, but save on production costs due to a great reduction in silicon waste, as this approach does not require sawing from ingots.